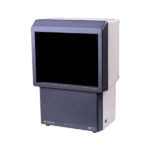 Marco’s new CP-770 AUTOMATIC CHART PROJECTOR refurbished by Vision Equipment Inc., combines all of the sophistication and efficiency of our previous 600 series models, but in a more compact, modernized design. In addition to being smaller, lighter, and cosmetically more appealing, the CP-770 also incorporates a new maintenance free LED illumination system that produces a brighter, more consistent high-resolution acuity image. 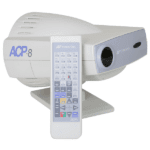 The TOPCON ACP-8 R Auto Chart Projector provides improved sharp and clear image projection and fast chart rotation. A cordless remote controller allows instant projection of the 30 AO compatible test charts at a rate of 0.03 seconds per frame. 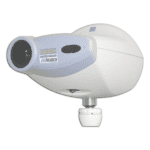 The Topcon MC 3 simulates an infinity projection, in shorter exam lanes, where images from a standard projector can not be properly achieved. Thirty individual charts are available.